¡Ay Chihuahua! This movie's a blast! Did you know it's from the Weinstein brothers? Me neither. They are buried twelve people deep in the Executive Producer credits. 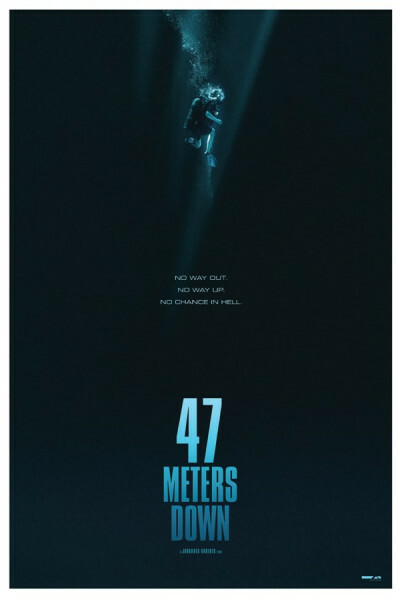 Anyhoo, that's important because 47 Meters Down has great production value. It's a very bare story, way minimalist, like Open Water, but I think Open Water is one of the best shark movies around. 47 Meters Down had us gasping for air for the better part of an hour. It's really claustrophobic, the majority of audio coming through Mandy Moore's mask. If you love shark movies, well, this one has your name all over it. If—like me—one of your greatest fears is being dropped in the middle of the ocean at night, well, it still has your name all over it...cuz it's that good. Well, maybe not *that* good, but I personally loved it, perhaps because I was so pleasantly surprised.